SevenVentures awards an extremely lucrative prize for the fifth time to the most innovative startup. Tinkerbots wins EUR 3 million in the form of TV advertising, an online advertising volume of EUR 200,000, and a digital-out-of-home campaign worth EUR 70,000. Tinkerbots wins EUR 3 million in the form of TV advertising, an online advertising volume of EUR 200,000, and a digital-out-of-home campaign worth EUR 70,000. It is one of the most lucrative competitions for startups: the SevenVentures Pitch Day. 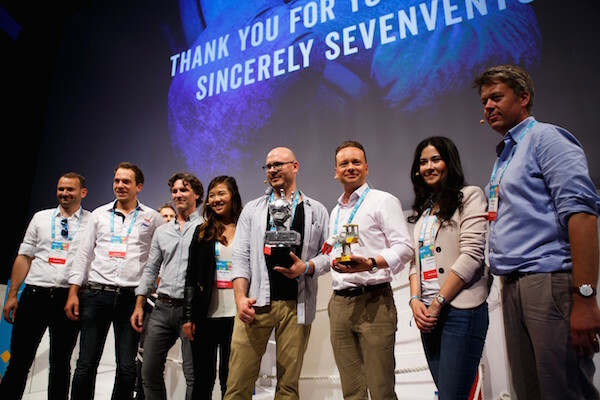 With the ring of the bell, the fifth SevenVentures Pitch Day kicked off in Munich, set on the DLDsummer Conference’s international stage. The following six startups from across Europe battled for the startup competition’s mega media budget prize: Bux (Netherlands), EXPORO (Germany), Kitchen Stories (Germany), Happn (France), Tinkerbots (Germany) und carwow (England). These startups’ innovative business ideas allowed them to surpass more than one hundred other applicants in the qualifying rounds. Bux makes trading stocks game-like. The mission of the crowdsourcing platform EXPORO is loud and clear: Investing in real estate simply and directly. Kitchen Stories no longer does “its own recipe thing.” Rather, it shares them with an enormous fan base with good taste. And keep your eyes on Happn. They offer a digital market place for love at second sight. Tinkerbots brings robots right into children’s rooms and provides excitement and creative ideas. And carwow not only compares new car offers, but also compares to the other startups. SevenVentures Pitch Day is not just a matter of glory and honor. The investment branch of ProSiebenSat.1 awards a prize in the form of a “full service media package.” This includes EUR 3 million in the form of TV media, an online advertising volume of EUR 200,000 and for the first time a digital-out-of-home campaign valued at EUR 70,000. SevenVentures also makes the production of a customized TV spot and campaign management possible, which allows the victorious company to reach their targeted customers on the TV group’s network more precisely. Entering the pitch arena to their specifically chosen music, the six new heavyweights to the startup scene were welcomed by moderator Steven Gätjen. In the first round of SevenVentures Pitch Day, each pair of candidates delivered a direct verbal exchange of blows to convince the jury: Their presentations had to win over Nikolaus Röttger, chief editor of WIRED Germany, investment expert Luciana Lixandru from Accel, and SevenVenture’s managing director Sascha van Holt. The audience of guests, media representatives, and DLDsummer Conference visitors made their choice of victor by televoting in the final round. In the end, Tinkerbots came out on top and now has the opportunity to reach an audience of millions through TV and online advertising. It all started at the Bauhaus University in Weimar where Christian Guder and Leo Oschütz met in 2005. They both studied product design and were similarly fond of unusual projects. Matthias Bürger, who was writing his doctoral thesis on economic innovations at the time, already knew both Christian and Leo from his circle of friends. In 2011, the three met with the goal of introducing the best robotic toy the world has ever seen to the market. The founders started a crowdfunding campaign on Indiegogo.com in April 2014 and in just 45 days, Tinkerbots collected pre-orders for more than 800 building sets worth USD 300,000. They were able to hire their first employees during the Indiegogo campaign and thus decidedly spurred development. There were many hurdles to overcome and paths to clear, but now Tinkerbots is in the homestretch.